Los Angeles – July 28, 2012 – Travel host, Brittany Pierce, took to the streets of Los Angeles to promote Rhythm Abroad at National Dance Day hosted by the Dizzy Feet Foundation. The event was held at the newly reopened Grand Park in Los Angeles. National Dance Day was created by Nigel Lythgoe, executive producer and co-creator of the hit FOX series SO YOU THINK YOU CAN DANCE to promote health and self-esteem through the art form of dance. Rhythm Abroad is a new PBS travel series that is sure to transport viewers into the heart and soul of a culture. Brittanytravels around the world connecting with people through dance and music. In each episode, she tries doing the local dance herself even if she looks like a blundering amateur at times. She finds dance and music to be the universal languages that bridges cultural divides and unites humanity. The new series is slated to air on PBS early 2014. For information on the series click here. 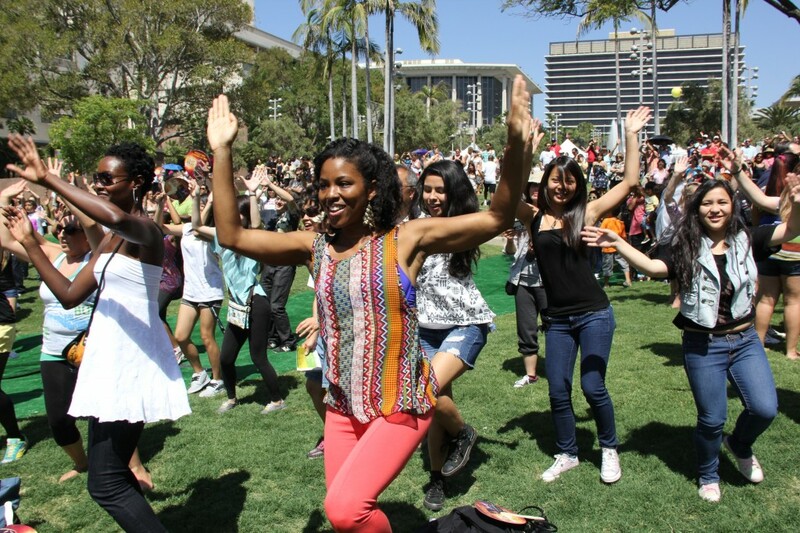 To see videos of Brittany dancing Zumba at National Dance Day click here.